Boy, those are six words I never thought would appear on this site! Honestly, I know very little about football except that the ball is brown, they play for three minutes and stand around for twenty. Come to think of it, it sounds like my kind of sport! 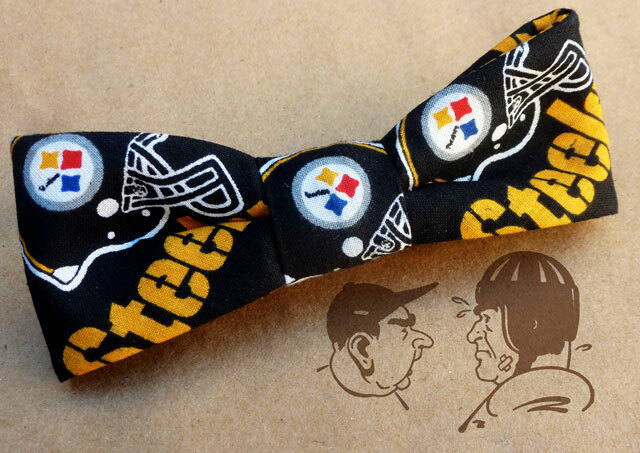 Anyway, I made this bow tie for my friend Michael who is a huge Steelers fan, and since he’s got a formal function to go to, I knew I had to get on the ball *snort* and get this tie made! He might opt for a black tie – but hey – it’s always nice to have a choice! If you’re interested in making your own there’s a tutorial here. This entry was posted in News, Sewing and tagged Bow ties, football, formal wear, Pittsburg Steelers, Steelers bow tie. Bookmark the permalink. 4 Responses to Are You Ready For Some Football? Their helmet logo has always been a favorite of mine! I know very little about football…. If Andy Reid’s mustache gets any longer, he’s gonna look like he’s peering over a hedge. If he can mispronounce “diabetes”, he’d be a shoo-in for Wilford Brimley!